A sumptuous, lyrical novel, Gerry Brennan wanders down avenues of politics and philosophy, love and death, art and culture, reading the graffitti along the way, seeking out dead ends in order to scale walls and emerge in courtyards. The novel of ideas lives on in Decresendo, in language as musical as any sonnet. At the graveside amongst the small crowd Kate alone cried and cried and cried. Irreplaceable. So this was what the thing called love was. This was what was meant by loss. All those silly things which were meant to convey the rites of passage from childhood to adulthood were trivial and wrong – there was only one gateway of entrance and it was the understanding that this thing called death was a living thing after experiencing it closely, nothing could ever be quite the same again. 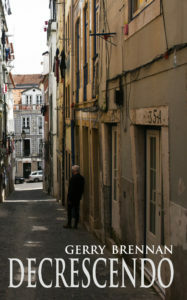 Gerry Brennan is a Dublin born poet who has lived in Lisbon, Portugal for the past number of years. In this, his first novel, he is attempting to break away from the traditional prose novel and instead infuse his work with poetry, dramatic dialogue as well as prose, whilst still maintaining a narrative.